You don't have to settle for poor outdoor pool lighting any longer. 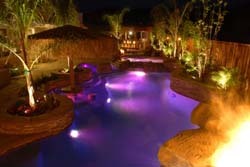 Create that backyard oasis by dressing up your pool with lighting to make it beautiful and fun. If you already own a pool, you can rejuvinate it and make it better than ever before. If you're installing a new pool, you have many exciting options to make your pool lighting and outdoor patio lighting flow. 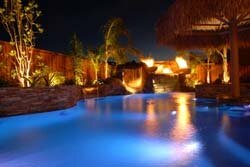 Lets look at some ways that you can use pool lighting to make your pool the center of attention. Enjoying the comforts of your pool at night is best done when you have the proper underwater pool lights. Without it, your pool will look dark and gloomy even if you have a bountiful amount of outdoor patio lighting surrounding your pool's perimeter. Underwater pool lights give you a better view of the pool's depth and texture so that you can feel comfortable when taking a dip in your pool at night. Underwater lights need to be sealed inside a water tight fixture. A rubber gasket helps keep water away from the lamp. This gasket must be in good condition so that it can do it's job properly. Even a small leak can be disastrous to the lamp and to the safety of anyone in contact with the water. Outdoor pool lighting fixtures are often tucked away in the pool's walls so they don't get in the way during use. It's important to inspect the fixtures each year prior to opening your pool. If you already have underwater pool lights but feel like they need something more, there is a simple solution. Pool lighting filters add a little fun to your pool lighting with the addition of color. These semi-transparent color filters fit onto your pool's lighting fixtures so that the light's beam spread emits exciting colors. These colors interact with your pool's painted or tiled floors to create the illusion that your pool is changing colors. If you own a large pool, try using different colored light filters on different parts of your pool. For example, select a different color for an outdoor hot tub to differentiate it from the rest of the pool. Try selecting different color filters for each section of your pool. This technique can help you separate sections of your pool in a stylish way without needing to use physical boundaries. You might choose a motorized color wheel that automatically changes the color filters for you. As the changing colors are amplified onto the pool's floor, your pool magically transforms right before your very eyes. You can synchronize multiple color wheels to change at the same time or independently of each other. 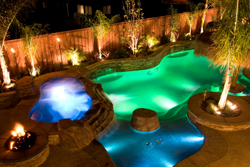 Fiber optic outdoor lighting can make your pool the coolest looking one around. They are perfect for underwater use because you never have to worry about damaging them. Fiber optic fibers are bunched together in a similar manner to the way copper wires are bunched together in an electrical cable. The cable allows light to travel along it's length and reach its destination. This prevents any electrical current from being exposed to water which could cause bodily harm to anyone who comes in contact with the water. The main light souce is housed outside of the pool in an enclosed water tight compartment. That light source supplies the light which then travels along the fiber optic fibers to its end point. These fibers can be embedded into the pool's base and walls creating a stellar masterpiece that will grab ahold of everyone's attention.